MATSUYAMA Co., Ltd., is a professional engine spare parts manufacturer and exporter for KOMATSU, CATERPILLAR, MITSUBISHI, TOYOTA, ISUZU, NISSAN, HINO and MAZDA in Taiwan. 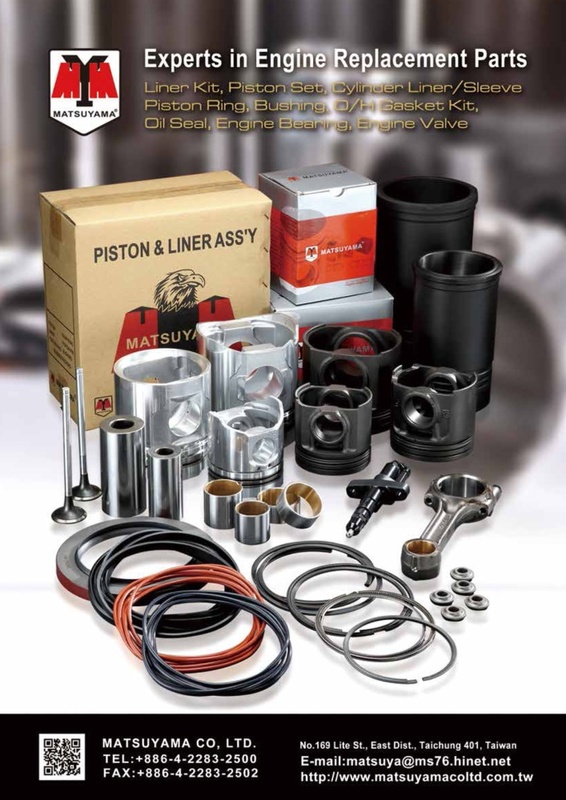 Based on more than 30 years experiences in developing and manufacturing engine spare parts, we can supply you the following quality-trusted engine spare parts, CYLINDER LINER KIT (including Piston Set, Cylinder Liners, Piston Ring Set, Piston Pins, Liner O-Ring, Clips and Bushings), PISTON KIT, IRON PISTON, PISTON RING, PISTON PIN, BUSHING, BEARING, LINER O-RING, OVERHAUL GASKET, HEAD GASKET, NOZZLE TUBE, OIL SEAL, INJECTOR ASSEMBLY. We are especially proud of offering wild-range of spare parts for KOMATSU and CATERPILLAR engine. If you have any questions regarding the spare parts, please do not hesitate to contact us any time. We are looking forward to hearing from you, and Matsuyama will be your best choice.